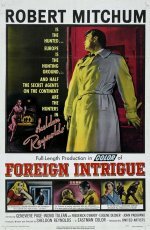 This spy thriller was shot on location in Europe, and stars a trenchcoat-clad Robert Mitchum at his most laconic in a movie whose murky plot and even murkier colour photography leave much to be desired. Still, Mitch does get to interact with two major foreign females, Sweden's Ingrid Thulin (billed as Tulean) and France's Genevieve Page, well before either had cinematically peaked, respectively with Ingmar Bergman and Billy Wilder. This was allegedly based on the Cold War experiences of its writer/producer/director Sheldon Reynolds, whose adventures formed the basis for a television series from which this film is a spin-off. His adventures must have been more exciting than his direction, for this would-be thriller merely lurches along its way. On its original release, this main feature was overshadowed by its supporting B-movie The Killing directed by the then-unknown movie genius Stanley Kubrick.